This is a typical house in Bermuda that you might see along the water: white ridged roof to collect rainwater, the sun shining warmly on the pale yellow stucco siding, the boathouse by the water. Looking at this scene can make you feel like you're on vacation - somewhere in paradise! 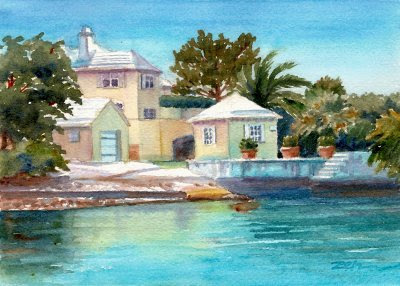 This painting is #42 of the Zeh Bermuda Collection.